Get Windows 8 for Dummies e-book for free! If you’re not familiar with the changes in Windows 8, it’s essentially Microsoft trying to get everyone to start using touch-screen devices. Don’t get me wrong…the new OS works great on the new MS Surface tablets. But, using an operating system optimized for touch on a laptop or desktop computer is proving to be more frustrating than innovative. They even have touchscreen-equipped laptops and desktops out now that allow you to “experience Windows 8 the way it was designed”. My problem with that is: When I’m using a tablet or a smartphone, I end up getting finger smears all over the screen and have to wipe it off on my pant leg every 10 minutes. I can’t do that with a laptop…so unless I keep a bottle of Windex “computer display approved cleaner” with me at all times, I’m doomed to looking at my screen through a layer of finger crud. That being said, Windows 8 is coming pre-installed on new desktops and laptops, so if you buy a new system you’re going to have to learn to live with it. The interface is very different, so it is safe to say users will need some guidance on how to use it. 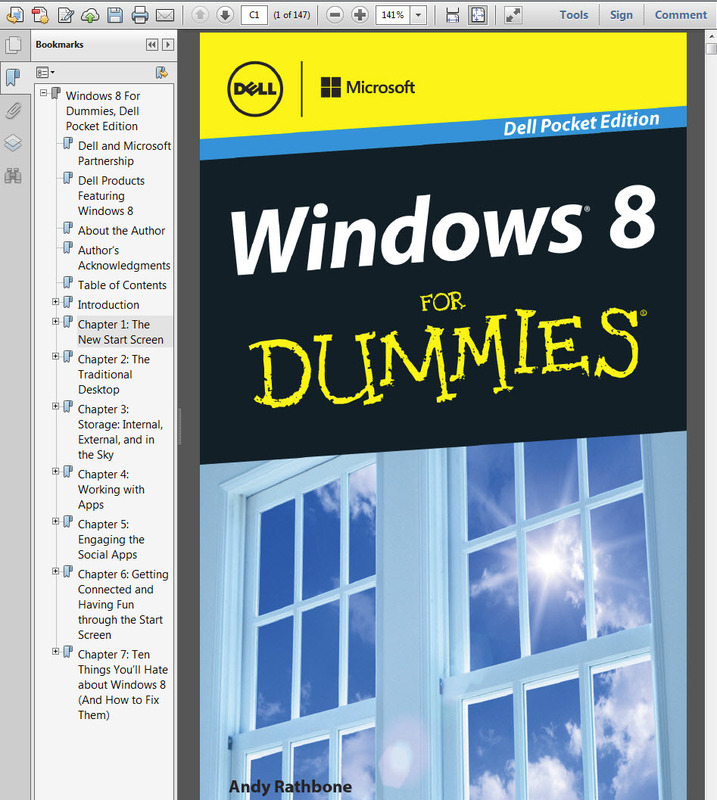 To help out, our friends at Dell are giving away a copy of Windows 8 for Dummies – Pocket Edition for free download (simply fill out the short form and you’ll be prompted to download the book in PDF format). If anyone is using Windows 8, please share your experiences so far. I’ll be interested to hear what you think. Hopefully the book will help. They made something that was easy to use and created a monster. I am almost ready to get rid of my new desktop and get a Mac. If I hadn’t just bought it a few months ago, Iprobably would. I hope you’re not using Windex to clean your monitor or HDTV! I tried to respond but did not seem to be reconized. Will this work with computer 7? Do you mean Windows 7? The book is about Windows 8, but you can open the book on any version of Windows (or Mac, or tablet, or smartphone for that matter).